five + = 6 Required Please enter the correct value. Yes, the Yahoo stock price today is down slightly, but Yahoo shares have still climbed 11.52% in the last month. Yahoo! Inc. (Nasdaq: YHOO) has renewed interest on Wall Street because it's having a yard sale. From Yahoo's Internet business to patents, apparently anything could be up for grabs to the right bidder. And with the deadline for first-round bids on Yahoo expiring on April 18, companies will be battling it out acquire the Internet giant. Microsoft Corp. (Nasdaq: MSFT), AT&T Inc. (NYSE: T), and Comcast Corp. (Nasdaq: CMSCA) were all rumored to be interested in Yahoo, but have apparently dropped out of the bidding war. Microsoft tried to acquire Yahoo in 2008, though, and says it may provide a "token investment" to the winning bidder. Although Time Inc. (NYSE: TIME) has financial issues of its own, it's also in the running. Time has reportedly talked to private-equity firms about partnering to make a bid for Yahoo's media business, according to Yahoo! Finance. There's also been speculation Softbank – the majority owner of Yahoo Japan and Alibaba Group Holding Ltd. (NYSE: BABA) – may make bids, but neither company has confirmed interest. But right now, it appears Verizon Communications Inc. (NYSE: VZ) and The Daily Mail are the two front-runners. According to Bloomberg, Verizon has already made a specific succession plan if it acquires Yahoo. Current CEO Marissa Mayer would be replaced by a combination of AOL CEO Tim Armstrong and Verizon's Executive Vice President Marni Walden. The Daily Mail receives only 50 million visits per month, according to Comscore data. But those numbers could quickly grow if the British media company purchases Yahoo. It's true that Yahoo has fallen out of favor as a search engine over the last several years. As of February 2008, Alphabet Inc. (Nasdaq: GOOGL, GOOG) accounted for 58.4% of U.S. Internet searches. Yahoo accounted for just 22.9%, according to CNN Money. Despite that, Yahoo still has attractive aspects for bidders. Patents for the Internet giant could be worth as much as $4 billion, according to Business Insider. Yahoo has over 6,000 intellectual patents in the mobile, data, and advertising technology industries. Yahoo has yet to clarify if it will sell its patents as part of its Internet business, or if would sell the rights to individual patents. But whatever company purchases them will benefit from owning the patents because it will have fewer hurdles to clear when creating new devices and technology. In 2015, Yahoo Mail and Yahoo News were the third-most visited sites in the United States, according to The Wall Street Journal. Just in October 2015, these two sites received a combined total of 210 million visitors. Since The Daily Mail only receives 50 million visits per month, it could increase its views over 300% just from Yahoo Mail and Yahoo News. 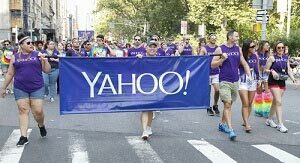 Even though Yahoo has struggled to make money, its platforms still have a large built-in user base. The right company could find a way to monetize each service. Analysts at Thomson First Call have a one-year price target of $38.48 for YHOO, which is a gain of just 2.69% from its opening price this morning. Profit Alert: Our Executive Editor, Bill Patalon, recommended a stock in 2011 that has returned profits of 130%. And he believes this stock still has plenty of upside. Find out more about Bill's pick in his exclusive Private Briefing newsletter.